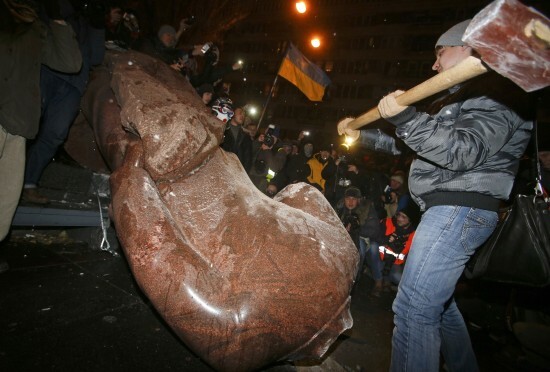 How many Ukrainians does it take to take down a Lenin monument, you might ask? Well, about 500 or so. 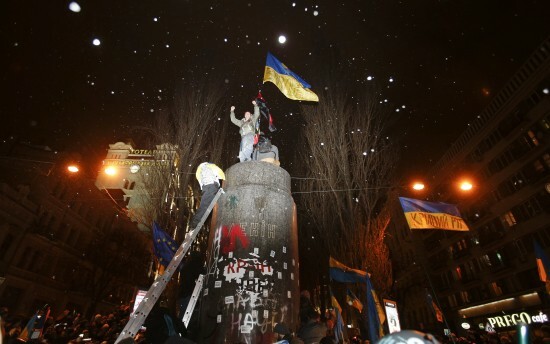 The toppling took place in Bessarabia Square in Kiev. The protestors then sang the national anthem of Kiev and chanted (my personal favorite), “Hang the Commie!” The protestors attempted this uprising last weekend, but the police beat them back. However, the Ukrainians seem to have a spine and the will to go after the communists — they know what communism leads to all too well. This weekend, the police didn’t even show. Probably because there were too many protesters and they valued their lives. The Communist Party there didn’t like this at all and complained heavily about these ruffians. They even stationed people to protect the statue. But in true cowardly style, the commies ran when the droves of Ukrainians showed up. After all, it’s not worth them dying for. 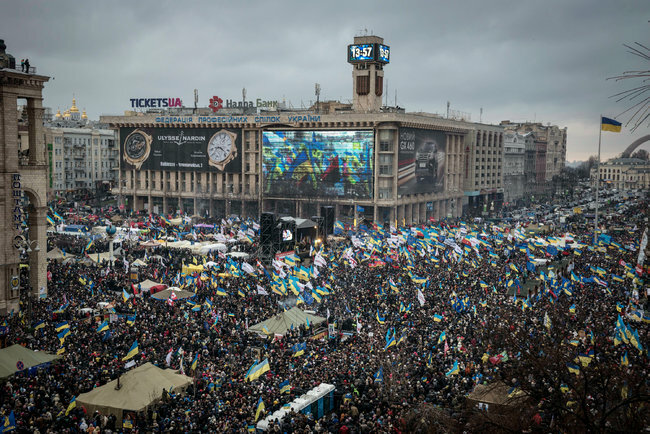 According to CBS News, several hundred thousand Ukrainians flooded the central square in the capital on Sunday, denouncing President Viktor Yanukovych’s decision to turn away from Europe and align the former Soviet republic with Russia. They didn’t just poke the Russian bear, they swatted it. Now the UN is sticking their nose in where it doesn’t belong once again. Although surreptitiously on the side of the protesters, their goal is money and things are never what they seem when it comes to Russia and their satellite countries. The people know their country is on the verge of economic collapse and are demanding free trade with Europe in an effort to save them. It won’t, but it might delay the inevitable for a short time. Yanukovich is pondering a state of emergency and may still send in the jackbooted thugs. There were reports on Sunday that the security services were preparing to bring charges of treason against three opposition leaders in Parliament, who have been at the forefront of the demonstrations leading the protesters in their dissent. One of the leaders, Arseniy P. Yatsenyuk, called for mass civil disobedience if Mr. Yanukovich tried to impose martial law. Just what do you think would happen here if the same was tried, hmmm? Yanukovich has decided not to sign the accords aligning the Ukraine with Europe and free trade. This is what started the whole revolt. He promised for over a year to sign them, but never did. Typical Marxist tactic: promise, delay, excuse, repeat… to buy time. Yanukovich fears Russia and Putin, which is sane, but craven in the extreme. Wonder how long till Russia gets tired of this and sends in troops? What I do worry about is this whole mess is reminiscent of the Orange Revolution which Soros was behind. I wouldn’t put it past the old spider this time – chaos in the name of freedom and more wealth and power for the elitists. But on the other side you have the commies, so it is lose, lose unless there is freedom for the people such as our Constitution guarantees. Unlikely, since America does not even enjoy those freedoms anymore. Kiev (AFP) – Pro-EU Ukrainian demonstrators on Monday kept up their protest against President Viktor Yanukovych after symbolically toppling the statue of the Soviet Union’s founder Vladimir Lenin during a gigantic rally in central Kiev. Hundreds of protestors braved early morning sub-freezing temperatures to maintain the open-ended demonstration on Independence Square in Kiev while others staffed barricades thrown up the day earlier around key government buildings. “It is impossible now to make a step backwards,” said protestor Volodymyr Kiblyk from the central town of Znamenka who has been at the Kiev protests for two weeks. Yanukovych didn’t just stall on the treaty, he betrayed it. He made a closed doors, secret deal with Putin. Hands were shook on a strategic partnership treaty with Putin, who wants the Ukraine to join a Moscow-led Customs Union. Putin bribed Yanukovych with cheaper gas and billions of dollars in aid (that the people will never see of course), to get his way. There are so many ways to spell treason. The Ukrainian security services have launched a criminal investigation into “activities aimed at overthrowing the government” as hundreds of thousands of pro-EU protesters gathered on Sunday in Kiev in response to calls for a “million-man march”. 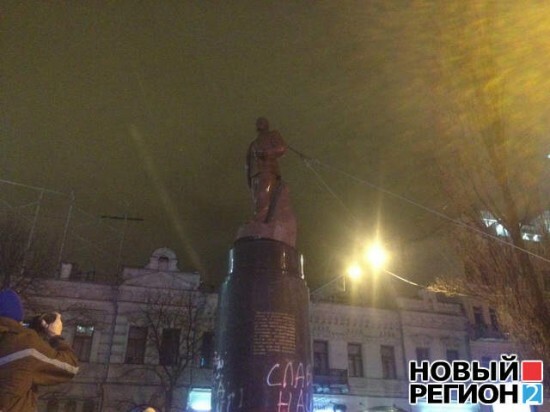 As darkness fell, demonstrators pulled down and decapitated the city’s landmark statue of Lenin and attacked it with hammers – a gesture representing a clear rejection of Russian influence over the country. 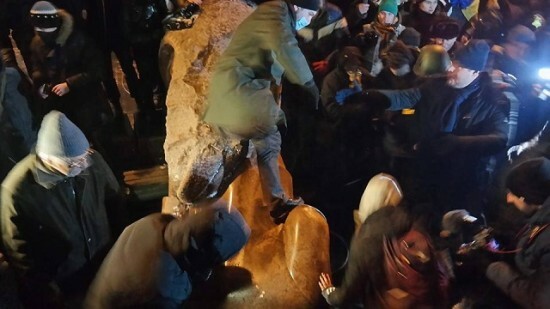 “Yanukovich is next,” said one of those helping to topple the statue. The SBU, said it was investigating several opposition leaders on suspicion of conspiring to seize power as political allies of President Yanukovich repeated accusations that the demonstrators were plotting a coup. Meanwhile, it would seem Yanukovich is hiding. He has not been seen and is rumored to be acting like none of this is happening and that it will just go away. Sure it will. Figures released on Friday revealed that central bank reserves fell more than expected in November, down to nearly two months of import coverage. This has complicated the government’s attempts to stop what appears to be the imminent devaluation of the hryvna, the domestic currency. Foreign currency reserves declined by almost 9 per cent, down $2bn to some $18.8bn, owing to currency interventions last month, the National Bank of Ukraine revealed. Speaking on state television on Saturday, first deputy prime minister Serhiy Arbuzov said his government needed at least $10bn in loans to cover near-term balance-of-payment needs. With rating agencies downgrading Ukraine’s sovereign rating and talk by the US Federal Reserve of “tapering”, or reducing its quantitative easing programme, analysts said borrowing on the eurobond market has become too expensive for Kiev. The International Monetary Fund has expressed its willingness to bail out Kiev but local authorities have balked at its loan conditions. In an interview with a local newspaper published this weekend, the IMF’s local representative denied Kiev’s claims that it was demanding sharp rises in energy prices for the poorest as a condition for a loan. Instead, the IMF wanted incremental increases of up to 40 per cent for wealthier Ukrainians, allowing subsidies for the poor to be sustained while also reducing the budget deficit. While all this is playing out, the US’ schizophrenic foreign policy is shoving the Arab states into the waiting arms of Russia. It’s that wonderful ‘flexibility’ that Obama was whispering to the Russians in action. All of this chaos and realignment is by design and you can look for Marxists and global bankers pulling the strings behind all of it. 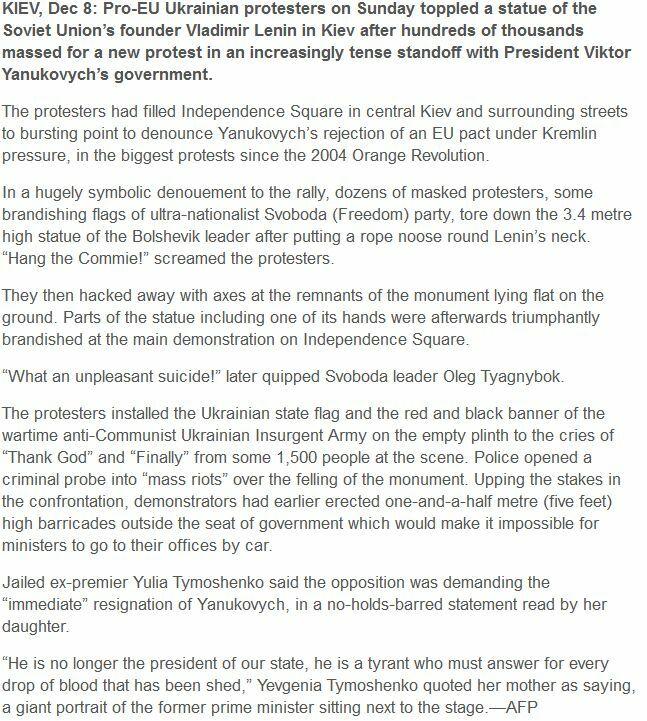 As the Ukrainian protesters boldly tell “Yanukovich, you are next!” astride the spot where the Lenin monument fell, America should take note. You are looking at our not so distant future with our Marxist leadership at the helm. Americans will not stand for this dictatorship much longer I fear and this country will experience violence as never seen before… well, at least not since the last revolution or the Civil War. 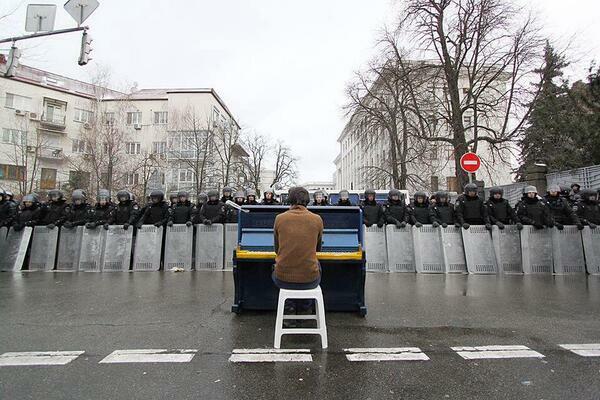 Whether it be the Ukrainians or Americans, none of us want to live under communist rule. 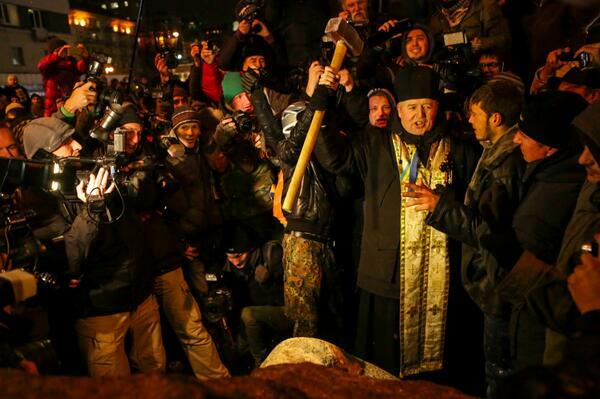 Despite the best efforts of Lazar Kaganovich and his Tribe, the Ukraine is still a white Christian nation. This is why South Africa, which was destroyed by Joe Slovo and his Tribe, has completely collapsed and the Tribe left nothing but Detroit in its place. We need to stop pretending that people don’t matter and everything we are can fit into a maxim. Ma’am, your posts are not welcome in Gulag Bound. Truth is not welcome. It’s best to completely and utterly ignore the past and pretend that everything just “happened” and no people were involved. It’s even better to pretend that people don’t matter. If I have no ancestors, then I have no heredity. If I have no heredity, then I have no property. If I have no property, then the Marxist revolution is complete. Gratz on living in the Gulag you pretend to fight.